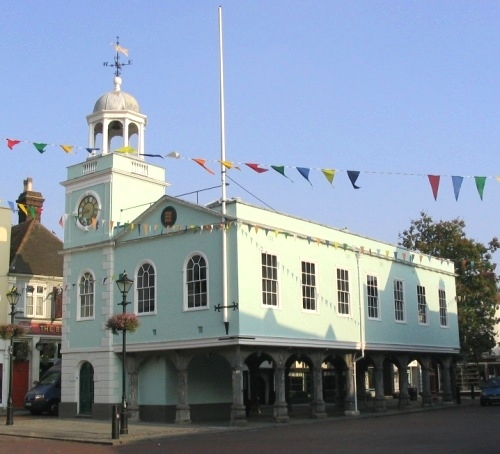 Faversham's Guildhall dominates Market Place and forms a focal point in the centre of the town. This is Faversham's third Guildhall. The first was on Guildhall Green in Tanners Street, more or less where the Gospel Mission Hall now stands. The town's early nucleus was in this area, but later its centre of gravity moved to Court Street. In about 1547 the Corporation built a new Guildhall where the single-storey section of the Shelter Shop now is, on the east side, at Middle Row's north end. Sometimes known as the ‘White House' (presumably because it was lime-washed white), this was where Queen Elizabeth I was entertained on her visit to the town in 1572. Evidently the new building was not a success because in 1603 the Council moved to the present, third, Guildhall. This had been built in 1574 as a market hall by community effort by the people of the town and 13 nearby parishes. Its open ground-floor arcade provided cover, as it still does, for market traders and customers. This was a popular building formula, though more common in the Midlands than in southeast England. The detailed building accounts, and list of contributors, survive in the town's first surviving Wardmote (Council Minute) Book. What sets the Faversham Guildhall apart from most of its counterparts is that it has a tower at one corner: in this respect it is more akin to Scottish tolbooths. Though the building is not large, the hall and tower still ‘float' gracefully over the town centre, dominating Market Place and forming Faversham's focal point. In 1814 to celebrate one of Wellington's victories in the Napoleonic Wars local yobs set fire to the Guildhall, and the upper floor and tower had to be rebuilt. The opportunity was taken to extend it by two bays to the north. The general outline remained as before, but the designer, Charles Drayson (1749/50-1830), worked in the prevailing Regency idiom. Thanks to Drayson's skill, there is no stylistic clash with the 16th-century arcade below. The building remained timber-framed, softwood from the Baltic, imported via the Creek, superseding the hardwood of its predecessor. It owes its elegance to simplicity, good proportions and a little subterfuge: some of the windows on the long flank wall are ‘blind' and are there solely to relieve what would otherwise be the monotony of a long wall with few openings. A cornice neatly binds the hall to the tower and a continuous parapet hides the low-pitched slate roof. There is a fine Venetian window at the north end. Pediments at either end feature the town's seal - virtually the same as the royal arms of England. Faversham is the only town in the country to enjoy this privilege. The tower is a little masterpiece of design, with its built-in clock, jaunty balustraded parapet and handsome octagonal cupola, topped by a windvane in the form of a golden dragon, with forked tail. The clock is dated 1814 and bears the name of Francis Crow (1755-1835), a maker who lived and worked opposite, at 8 Market Place. The inside of the hall is arranged as two rooms - a large council-chamber and a smaller committee-room. After 722 years of successful self-government, and much to the regret of most of its people, Faversham lost its borough status in the 1974 upheaval. However, partly through the efforts of the Faversham Society (in alliance with Amersham Urban District Council in Buckinghamshire), provision was made for smaller towns to have their own 'Successor parish councils', usually known as town councils. In the case of former boroughs, such as Faversham, they could also retain their mayors. This was an important concession, because towns need mayors of their own, and Faversham's has always had plenty of work to do. Henry Wreight (1760-1840), a solicitor who lived at what is now Wreight's House, in the section of The Mall that formerly counted as Preston Street, was one of the town's two greatest benefactors, the other being Henry Hatch. A bachelor, he died rich and left his whole fortune to the town. This made possible the provision of the Recreation Ground, which is Faversham's largest park, and the building of two schools and the huge group of Almshouses in South Road. The portrait, originally presented to him by the Corporation, shows him seated in the mayoral chair, still in use, holding plans for almshouses that he endowed during his lifetime, and with the Parish Church in the background. John Andrew Anderson, a local businessman who became the town's first County Councillor in 1888 and gave generously to charity during his lifetime, as well as leaving a bequest for the poor. In 1869 he built Hillside House in South Road, since converted into flats. George Beckett (1744/5-1836), who was mayor in 1785, 1794 and 1804. He was a grocer at 1 Court Street, in the shadow of the Guildhall. His portrait was presented to the Corporation by Richard Gibbs in 1849. It was Gibbs's father, William Gibbs, who rescued, and presented to the nation, the superb Jutish jewellery from the Kingsfield cemetery when it was disturbed by construction of the railway in the 1850s. The Council Chamber walls bear panels listing mayors since 1292, with small portraits (mainly photographs) of most since 1840. These portraits were collected and presented by Herbert Dane, who was Editor of the Faversham News for more than 50 years. In the Committee Room is a superb twelve-panelled carved overmantel that once graced 12 Market Place (now Stead & Simpson), the home of Henry Hatch, a great local benefactor, who died in 1533. The overmantel was evidently carved during Henry VIII's marriage (1509-1533) to Catherine of Aragon. Featured in the top six panels are the arms of the Cinque Ports; the Aragonese pomegranate; St George and the dragon; Hatch's merchant mark; the Garter; and the Tudor Rose. The portraits in the bottom six panels - of Medea and Jason; Helen and Paris; and Judith and Holofernes - are of couples characterised by unfaithfulness, and this suggests that the overmantel was carved towards the end of Henry's marriage to Catherine, when he had made up his mind to divorce her because of her failure to bear him a male heir. If so, it was quite a sharp bit of political commentary, and may have served as an ice-breaker when Hatch entertained visitors from London. Outside the Guildhall, at its north end, is another of Faversham's little jewels - the Market Place pump. Before the arrival of a piped water supply in 1864, local households were dependent for their supply of water on pumps and wells. The first pump on this site was provided by a local benefactor in 1635. 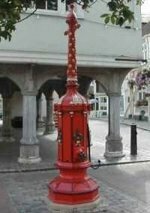 It was replaced by the present elaborate pump in 1855. This was used till within living memory and doubtless there is still ample water in the well below. In a brewery town, as you might perhaps expect, folklore has it that the pump flows with beer on Christmas Eve! It used to be topped with its own elegant gas lantern and it is hoped one day to restore this.